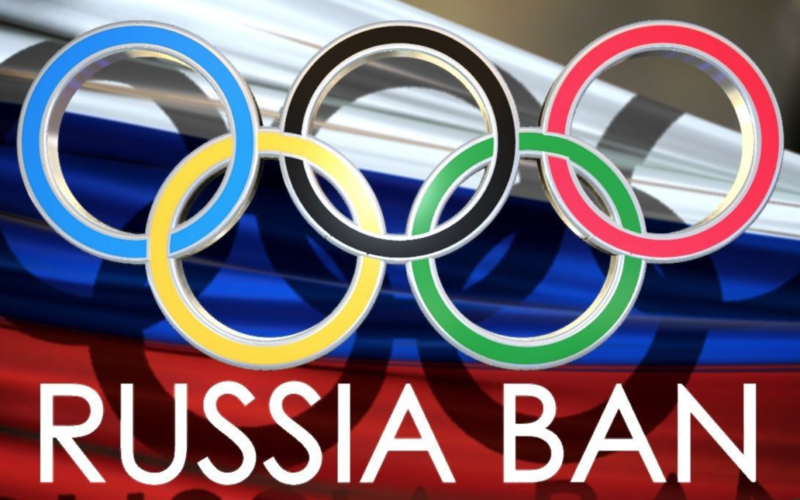 I spent a lot of time covering sports doping, and have to say that the International Olympic Committee’s decision to ban Russia from next winter’s Games is by any measure extraordinary. But not for the reasons you may think. There have always been two Olympics: The medal games that play out on camera, and the drug games that unfold in the shadows. The Russians are masters of both. In my book Steroid Nation, I go back to 1954 to tell the story of a Maryland doctor named John Zeigler, who was shocked when he travelled to Europe as an advisor to the U.S. weightlifting team and found Russian athletes using catheters to urinate clean blood after they got shot up with straight testosterone. Fueled by patriotism, Ziegler started experimenting with what he called a “kindler, gentler testosterone” for U.S. athletes. It eventually became Dianabol — the steroid that changed the sports. Fast forward to the 2014 Sochi Olympics in Russia, exactly seventy years later. Fake catheters were out. But fake urine was still in. The head of Russia’s drug testing lab — which was supervising testing for the entire Olympics — engineered an ingenious plan to pass the dirty samples of doped-up Russians through a small hole in a lab wall that led to a hidden room. 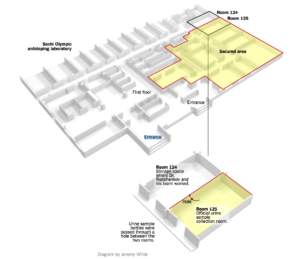 As reported by the New York Times (and shown in this diagram), secret police stationed in the hidden room then removed supposedly tamper-proof tops and replaced the dirty urine with clean stuff before replacing the seals so no one could notice. It was the very zenith, or nadir, of state-sponsored cheating. A friend of mine, Jack Robertson, was the investigator who helped blow open the case. A career DEA agent who’d been hired away by the World Anti-Doping Agency, he relied on the testimony of Russian whistleblowers to help him close in on the culprit — the director of the Sochi lab, Grigory Rodchenkov. If you’re interested in seeing what happens when the walls close on a man, I’d recommend the Netflix movie Icarus. The filmmaker Bryan Fogel happened to be making a documentary about doping when he caught Rodchenkov on camera (actually, on Skype) narrating his own downfall. What you don’t see in the movie is Jack. Because by the time Rodchenkov was fleeing Russia and into the waiting hands of America’s FBI, Jack was fighting another behind-the-scenes battle, this time with his bosses. In this remarkable interview with ProPublica last year, he recounted being stunned when Craig Reedie, the head of WADA, sent an email to the now disgraced Russian sports minister apologizing for the investigation. 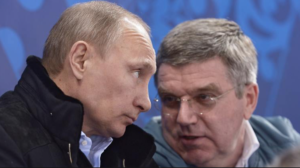 “[He said] WADA had no intention of harming their friendship,” Jack recalled. Why would the top drug testing cops bend over backwards for the Russians? You can make all the Trump jokes you want. But the answer is simple: The winter Olympics in Sochi cost an estimated $50 billion. That’s $1.5 billion for every medal the Russians won. Fast-forward again, to yesterday, when the International Olympic Committee banned the Russians from next winter’s Games in Pyeongchan. I asked Jack what he thought, thinking he’d view it as vindication. But he was just getting warmed up. What about the symbolic value of preventing the Russians from flying their flag — except, perhaps, in the closing ceremonies, per a loophole the IOC left open — and making its athletes perform in neutral colors? I tell you all of this so you’ll have something to tell your friends if this comes up in your conversations. There’s going to be a lot of back-patting and posing in the months to come. But the man who broke the case wide open isn’t jumping for joy. There is no better champion for clean and fair competition than Jack Robertson. From the time I have known him (1992), he has investigated the worst of the worst in drug trafficking from Colombia and Mexico to the United States, Europe, Asia and Russia. He has saved countless lives and everything a cop and investigator should be. Nobody I know investigates to the extent Jack does and he is 100 percent correct on this one. WADA and the IOC need new leadership with the integrity of Jack Robertson. God Bless you our friend. If we all shared Jack’s integrity and sense of purpose law enforcement would be far more productive…Jack is rare in that he holds both himself and others equally accountable. No one works harder and he remains a testament to the success that comes from tireless effort for good. Gear Grinder…Raw Deal – I was fortunate to witness it all firsthand and it was a stunning example of how it should be done…..